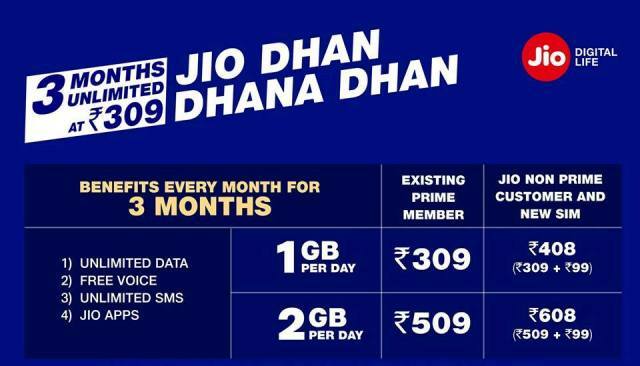 Reliance Jio Dhan Dhana Dhan plans have been updated to give Jio Prime user data benefits till June End. Then Reliance Jio announced to excited offers that Jio Prime members can avail unlimited services for 3 months with rupees 399 Plan. The earlier launched rupees 309 plan will provide 2 months of unlimited Jio services and the new set of plan benefits will be available from 11th July according to a Jio customer care executive. Here are various types of Recharge Package and you can choose recharge from Jio official website. But the latest offers are applicable for Jio Prime members. Prepaid tariffs are inclusive of all applicable taxes. All customers will have the option to opt for Jio Prime membership upon subscription to any available Prepaid plan and payment of rupees 99. For prepaid subscribers one month denotes 28 days. The above 4G plans can only be availed by customers possessing a LTE compatible device.